As neighborhoods encroach further into the wilderness, encounters with mountain lions are becoming increasingly common. Recently in separate incidents, people have witnessed some bizarre mountain lions that are entirely uncommon. In one story out of East Texas, residents have reported seeing an albino mountain lion. A video of the cat shows a white figure, but it’s difficult to make out exactly what it is. “The cat jumps across about a 6 foot creek there. At first, my initial thought was it was an edited video, but upon talking to people I believe it’s true. A white albino mountain lion,” investigator Hershel Stroman, of the Morris County Sheriff’s Office told KLTV Channel 7. Others say the footage shows a large domestic cat, but those who saw it say they believe their eyes. If it is an albino cougar, it would be one of the rarest occurrences in nature. Last year, there were reports of albino deer, but an albino mountain lion roaming around during the day would be extremely rare. 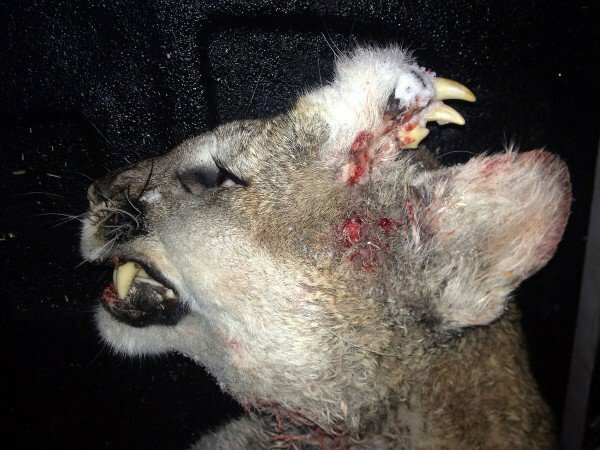 In another story, out of southeast Idaho, a mountain lion was found with a bizarre deformity producing teeth from the side of its head. Biologists suppose the extra teeth and whiskers could be the result of a tumor known as a teratoma or the result of a conjoined twin that failed to develop fully.